I don’t know about the rest of you, but I’m seeing a huge slump in the industry right now, in fact in most industries. It could be a result of the unfortunate drop in the economy in the U.S., it could be a bit of saturation in the market, it could be clients are holding off on spending, or perhaps it’s all the competition out there, heck it could be me! I hear a ton of talent throwing in the towel or they just stop investing all together. The problem with this is that in order to succeed, it takes consistent up keep and investments and we are in a slump – it’s up to us to get out of it. 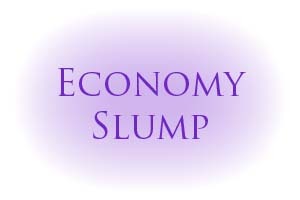 Keep in mind, what is a slump for one person may not be the same for another, but a slump is a slump. We get conditioned to a certain standard of work and income so anything outside of that is a slump. I am seeing less students booking and although I’m still voicing away – I am seeing a slow down in VO bookings. I don’t know how many of you are talking about this, admitting this or acknowledging this – but I am hoping this will prompt some comments as to how you are finding the industry at this time so that we can ban together for support. I remember asking Bob Bergen one time if he ever worried about his income from month to month. I would like to think that someone with the caliber and reputation of being on the top 100 list of voice talent doesn’t struggle with his income…..alas he is the same as the rest of us. In fact it’s harder for the veterans because they have been involved in a much more lucrative industry that is slowly diminishing into a fight for the lowest rate. Bob, like the rest of us, has to consistently keep at it to grow (which is probably why he is on the top 100 list in the first place). The difference with higher paid talent is their expenses are higher therefore their standard of living is also higher so their need for a good income is crucial to their survival. So as you can see, this happens to us all. It’s what you do with it that matters. So if times are tough, slow, or even a void of work – WHAT ARE YOU DOING ABOUT IT? I tend to live a proactive life. I like to turn most negative situations into positive ones as I truly always see the brighter side. Most people find negative easy to see, I am the exact opposite – not 100% of the time, but close. Spending time with you, I can spread my positive energy around, but I can’t be everywhere at once, so that means you have to find your own energy to draw from. As I see the slow times creeping in, I am reminded of how I got here to begin with. Trust in what brought you success in the first place, as it will do it again and again. We tend to learn new things, they work for us, we get comfortable and trusting that it’s now working and we stop trying. It seems backwards if we have to go back to where we started, but it worked once…so trust that it will work again. This goes for skills as well as your marketing. So are you spending your time complaining about the slump or your lack of work, or are you doing something to change the situation? I could give you a million reasons as to why I’m seeing a slump in the industry, just like a child or adult could give you a million reasons why they did “something” wrong. We are FULL of excuses, so I encourage you to stop making them and start finding results. I say this consistently and I don’t mean to be a broken record, but there is always a way to get what you want. Perhaps you just haven’t been influenced or guided the right way to put your creativity to work. Take this time to work harder, not to give up. I’ve worked very hard to get where I am today and it looks like I’m going to have to keep working hard to keep succeeding. It’s easy to give up – it takes work to get work. I don’t know about you, but I will rise to this challenge and put in more hours if I have to, pitch more clients, bug more agents, join more sites. I WILL NOT LET ANYTHING INTERFERE WITH MY JOURNEY – I hope you won’t either. If you need some motivation reach out! Share your stories. Let’s all band together and be a great positive support system. There are so many of us out there. So many sites, so many social networking and support opportunities. Although many of us are competition together – the Voice industry is full of support more than any other acting community. We all need encouraging words through bad times – so let’s use our words, our energy and our support to help each other through. WE ALL DESERVE IT. After all our voice is what got us here to begin with and our voice is what will keep us strong. Don’t give up – get smarter. YOU CAN DO THIS – I’m living proof.